The adoption of advanced technologies in the healthcare sector will always be considered a priority in modern day facilities. At some point in our lives, we will all need treatment in one way or another and we rely heavily on those working within this sector to improve our health and well-being. With this in mind, the introduction of new technologies must allow healthcare practitioners to work safely and efficiently in order to provide the highest level of patient care. We think that safety and efficiency are two of the best ways to describe the Hänel Rotomat. The Rotomat carousel is future-proof, flexible and adapts to your needs whilst integrating safely into your facility. 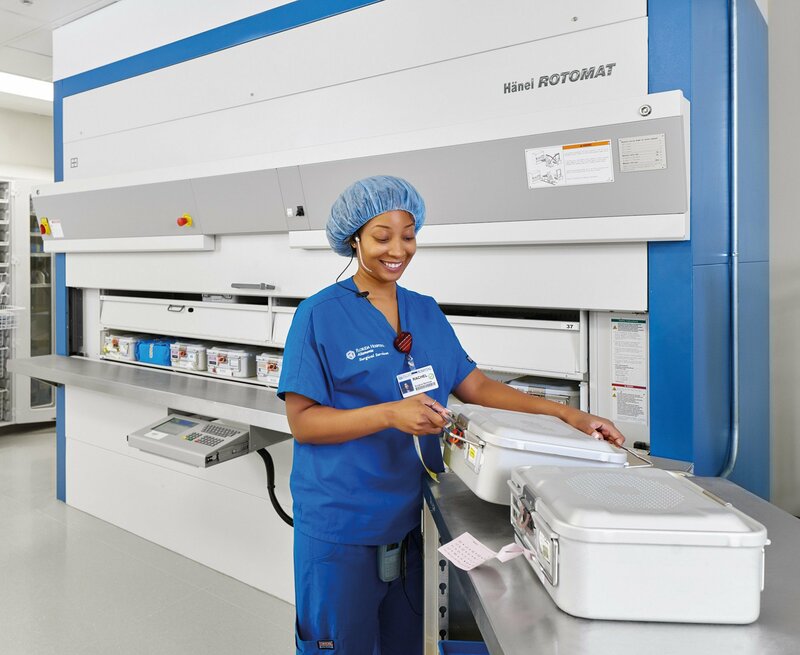 We know that not only are medical environments held to the highest standards, but they are constantly changing, and that’s why the Rotomat is so suitable. What we’ve learnt over the past 22 years, is that all facilities are different and when it comes to generating efficiency in the healthcare sector, we have to adapt our thinking to appreciate the areas of concern in specific medical environments. 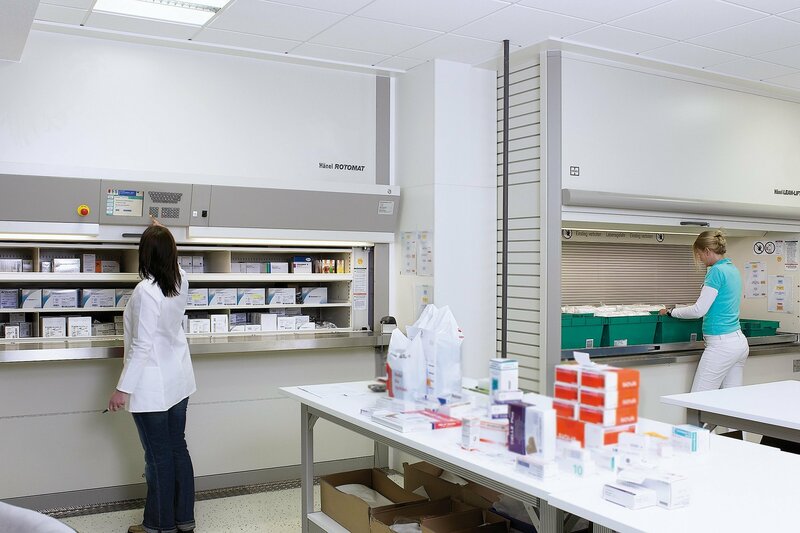 From dispensing to administration, laboratory to pharmacy, when choosing new and effective technologies, like the Hänel Rotomat, these systems act as an aid in supporting staff. Outdated and inefficient systems become obsolete, and time-consuming tasks are reduced so staff have more time for the important jobs. It can be said however, there is one problem that all facilities have in common – space. Space in hospitals is limited, there’s only so far a department can expand (especially those located in urban environments) and with the Rotomat, it’s proven that you could save 60%-75% in floor space. Consequently, when the space previously used becomes compacted, there’s only so far staff will need to go to search for items; this decreases the time spent looking for items and in turn increases productivity. Analyse how much space you could save with our ROI calculator. We know that it’s not simply about the size of the space, but also the type. A variety of drugs and specimens need to be stored in a controlled environment and that’s why we offer Hänel ClimateStore® technology so staff can store temperature sensitive items correctly and with ease. The Rotomat has a reliable temperature constancy to ± 1°c and can store specimens between –20° to +60°c and it’s not just the temperature that can be controlled either, by opting for an antimicrobial surface finish, the Rotomat can provide an effective sterile environment. We’ve identified one of the key requirements for our existing healthcare clients is traceability. Within a dispensing environment handling large quantities of pharmaceuticals, all different in size and weight, can present challenges. The Hänel Operations Journal Logging module is a popular feature for Rotomat users as it allows you to quickly track who accessed what and when. All your staff need to do is store or retrieve the items, and the Rotomat does the rest. For those with higher security requirements, this can be achieved by storing each item behind electromagnetically locked compartment doors, and because traceability is paramount, all retrievals are logged after each use. Within medical environments, drugs can be assigned to specific members of staff, and access will not be granted to those without authorisation. When considering the benefits of increased traceability and security it has to be acknowledged that the number of lost and misplaced items decreases, and this is due to an increase in personal accountability. Costs are reduced due to less mistakes or theft, and this in turn supports financial growth. However to provide a truly complete solution, the Rotomat needs to fulfil your IT objectives too, not just your financial ones. This is why Hänel have developed Hänelsoft; the inventory management software that can control your stock by PAR level, expiration date and the First-In First-Out instruction. We’ve found this software has been particularly popular with pharmaceutical applications, and even if your facility is already working off a particular interface, Hänelsoft has been developed to include integrated interface capabilities, so far successfully integrating globally with Censitrac, CSiQ, Impress and SPM, to name a few. Whatever your storage requirement not only will the Rotomat optimise limited space in your department, it’ll enhance working processes and the overall productivity of your staff. We offer a free, complimentary site audit to identify how you could start improving your current storage method and provide you with the advice you need to take your facility forward.